An Activation to commemorate the third anniversary of the South Australian National and Conservation Parks award program for radio amateurs. I chose to activate the Kenneth Stirling Conservation Park in the Wottons Scrub section. The Park is in four sections: Filsell Hill, Wottons Scrub, White Scrub and Burdett Scrub. Filsell Hill is the largest of the four sections and some time ago I set to activate this section. The Park is only accessible though private property and as I had made no arrangements I abandoned my plans. However, Wottons Scrub is easy to find and is well sign-posted. My wife and I checked out access about a week ago and have resolved to return to Wottons Scrub for a walk. Much of the land for this Park has been acquired for the people of South Australia and the nation by the generosity of benefactors. The park is named in memory of Kenneth Stirling, one such benefactor and so was Wottons Scrub (a Mr Wotton). I chose to set up in the park on the track which leaves the gate where I parked. I took my gear about 100 metres into the park within a small cleared area and set up my station there. I was probably invisible to motorists driving the road, but I could see back to the car park from my spot and I made sure I did not impede bushwalkers. However, there were no walkers: I had the Park to myself. The photo shows the Yaesu 897, my LiFePo4 battery (8.4 amp hours), clock in UTC, and my log (with writing showing the end result of being a note taker for too long!). This photo shows another view of my station. The ten metre squid pole is mounted on my tripod and the ends of the linked dipole are in trees at about two metres from the ground. It is a splendid location. This photo shows the view looking down the track away from the gate. This photo is taken from the track looking back to the Gate. My operating position was on the right hand side of the track heading away from the gate. 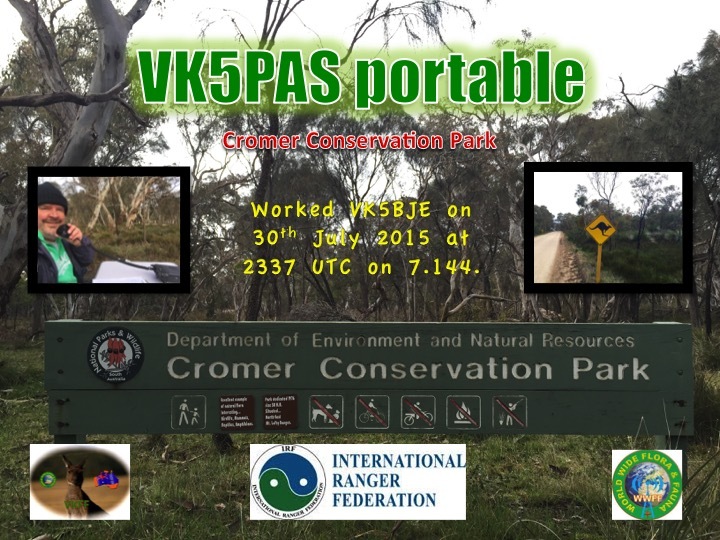 I was on the air at 23:45 UTC (2nd April 2016) and my first contact was with Peter, VK3PF/P in VKFF-0113, Coopracambra National Park, in East Gippsland. Signals were 5 and 7 both ways. A Park to Park contact over such a distance with two low power stations was a good omen. Thanks Peter for the excursion to East Gippsland. 23:17 VK4AAC/P3 Rob was in VKFF-0961 Cobram Regional Park. Signals were 5 and 9 both ways. A second Park to Park contact sequentially – this is really great. Thanks Rob, we appreciate your mammoth excursion. Then in succession I had contacts with: VK2BJP, VK3ZPF, VK3MCD, VK3FADM, VK4FW, VK2IO/p at 23:32. Gerard was in Belford National Park, VKFF-0023, 5 and 2 both ways. I had already worked Gerard in this park from home but it was great to have a Park to Park contact. Then followed VK3AFW, VK2XXM, VK3MRH and then VK6MB. I gave Mike 5 and 6 but he had noise and he gave me 3 and 2 However, it was great to have the contact on 40 metres. VK4RF and VK4HA were both 5 and 8 and I received 5 and 5. It was good to get Rick at such a good level. Then followed VK1MA, VK3DPG, VK3VWS/P, VK2NP and on the 3rd of April just after UTC rollover, Peter, VK3TKK and Tony, VK3AN, about to do a Foundation assessment for an aspiring amateur, Barry, with whom I had a discussion and wished him well and then VK7MBP near New Norfolk in Tasmania s5 and 8 and 4 and 5 received. At 02:22 Mick, VK3PMG, 5 and 7 and 5 and 5. There were no South Australians in the log at this stage. Perhaps they were all worn out and were sleeping in? I knew they were out and about and had received reports from other stations commenting on the number of VK5s in the field. There was no short skip. I saw the contact with Mick, VK3PMG as a sign conditions were beginning to change. The came VK3MCK, VK3ZMD, VK3FQSO, VK3AWG, VK3FAHP/P and VK3AN a second time. At 00:40 I had a slightly longer contact with Tony, VK5ZAI/P3 who was camped at Laanecoorie Weir, about 30 kilometres from Bendigo, Signals were 5 and 8 and 5 and 9 received. At 00:50, VK3DBP, VK1AT/P3 at Raymond Island in Gippsland, VK5PAS/P, Paul, a Park to Park contact who was operating from VKFF-0940, Waitpinga Conservation Park. While we made a successful contact it was hard work for Paul, 5 and 7 and 5 and 1 received. At 01:18 I had contacts with VK5GJ/P, Greg and VK5GI/P, Norm, who were operating from VKFF-0999, Bandon Conservation Park. At last a sure sign that propagation was beginning to open up locally. I then worked John, VK2YW, 5 and 9 both ways, VK3VTH/P5, Tony at VKFF-0792, Big Heath Conservation Park in the South East of South Australia and VK5ZGY/P, Greg in Billiatt Conservation Park, VKFF-0821. Then followed VK3EJS and VK5PL, David in the Marne Valley Conservation Park, VKFF-0906. Adrian, VK5FANA was in VKFF-0876, Carribie Conservation Park. I then worked Peter, VK3PF/P at Mount Raymond, in Mount Raymond Regional Park, VKFF-0975. Then followed VK3AIG, VK5HSX/P, Stef in Beachport Conservation Park, VKFF-0791, VK5TN, VK3SIM, VK5AAH, David in the Fort Glanville Conservation Park, VKFF-1031, VK5PAS/P, Paul in Waitpinga Conservation Park, VKFF-0940, VK7CW, Steve in Tasmania, VK3MEG, VK5AV and finally, VK1AD, Andrew. This was a rare contact for Andrew and I. He is either QRP and propagation is not working in our favour or noise is an issue at his end. In summary, I enjoyed 51 contacts and thus qualified the Park, with contacts from VKs 1 through to 7. The highlight for me was working 14 other Park operators, or Park to Park contacts. Thanks to all of the operators: at home or in the field who helped make this morning activation so successful. On Friday morning we, myself and xyl, Jenny, decided to go for a walk in the Mylor Conservation Park, VKFF-0785 and 5CP-156. Mylor Conservation Park is 49 hectares and preserves remnant bushland in the Adelaide Hills. The walk though the Park is not strenuous and the bush is magnificent. The Park is near Mylor and is just over seven kilometres from my house. I previously activated this Park for the WWFF program two Friday afternoons previously, that is on the 12th February. On that occasion I brought the activation to an end as a result of being bitten by ants. I was aiming for 44 contacts. I did not reach that goal. So we thought we would explore the Park thoroughly and we did. I was hoping to find an activation spot away from power lines, nearby houses and on gravel or some other hard surface to minimise the risk of ants. We entered the Park at the main gate and followed the sealed track to the end of the Park. Here we saw a wooden building which can be hired for camping. There were also open areas nearby, which, if not for the high tension lines on Whitehead Road, would provide great activation spots. The Park is on the left hand side of the picture opposite Gate 2. Private Road to Thai Monastery. I explored another side track which took me to Gate 5 and we returned to the car park on the track which is also part of the famous Heysen Trail. The picture below shows that the unnumbered Gate was on the Hooper Road boundary. I did consider this previously (12th February) as an activation spot but thought the bundled power lines overhead would cause too much noise. We also took coordinates where we found a very small patch of couch grass on the track in a low spot which was still damp. These coordinates will be sent to the Friends of Mylor Conservation Park. About half way along the sealed track (an old road) there is a cross road: this is roughly in the centre of the Park and there are posts in place for mounting squid poles. This would make a great QRP location away from the noise, reasonable elevation, probably 330 metres above sea level, but the only access is by hiking. You would have to be prepared to take a ground sheet and sit on the ground. This is not much fun for a Park activation! My operating point was half way between 1 and 8 on the Centre Track. I decided to compromise. I would walk into the Park carrying my gear. In preparation for the late afternoon activation, I loaded the large ruck sack with my Ipad and modem, three LiFePO4 batteries, two antennas, log book, water and jacket. The exercise required two trips to carry my gear. On the first I carried my tripod, squid pole, table and chair. The walk was about 300 metres uphill. On the second trip I carried the back pack and my FT897 in its black plastic case. I have learned the hard way: the gear is heavy but I have an FT857D on order which will help! All together with the walk in the morning and the afternoon return visit my pedometer reported I had walked 15,146 steps (my goal is 10,000 per day) or 12.25 kilometres and that I had burned 2990 calories. I have to report that on Thursday afternoon, VK5PAS, Paul, VK5KC, David and I had indulged in coffee, cake and cream! So I had extra motivation for the walk! I set up my gear and was on the air at 05:52. I found 7.120 to be clear and called CQ. I was answered by VK5HDW, David in Ferner Conservation Park. I gave David 5 and 8 and received 5 and 9. I thought that 40 metres looked pretty good for a change! I saw that Rob, VK4AAC/P5 was operating on 7.100 from Danggali Conservation Park and secured a contact before going back to 7.120: 5 and 9 each way. VK3PMG/M, Mick, was driving west near Ararat and we had a contact 5 and 6 each way. Then I was called by VK3PF, Peter who gave me 5 and 8 and I gave him 5 and 6. Then Brian, VK5FMID, from Mount Gambier called: he was 5 and 8 and he gave me 5 and 7. At 06:03 Rick, VK4RF/VK4HA called: signals were 5 and 6 each way. Thus with six contacts around South Eastern Australia, I was able to determine that propagation on the 40 metre band was really quite good and it should be a fun activation. Then in quick succession followed VK5NRG, Roy; VK5FANA, Adrian on Yorke Penninsular; VK5PAS/M, Paul on his way to Kaiser Stuhl Conservation Park; VK5GJ, Greg; VK5YX, Hans; VK3TKK/M3, Peter 5 and 9 both ways; VK3DBP, Paul; VK5NFT/M, Tom; VK3FJBA, Joe near Melbourne; VK5PL, David; VK5AV, Tim; VK2HHA, Dennis from Albury 5 and 8 both ways; VK3FIRM, Mike; VK5EE, Tom; VK5ZGY, Greg from Mount Gambier. I them moved to 7.144 and listened before callling VK5HSX/P, Stef in Deep Creek Conservation Park. I decided to chase Stef, VK5HSX/ because DX stations, although weak, were on 7.110 and making the going a bit hard. I decided to stay on 7.110 for just a little longer to and worked VK5KLV/P, Les in Winninowie Conservation Park. At 06:45 I worked a succession of stations: VK5FPAC, Bob; VK3JK, Craig; VK5KKS, Kevin; VK3BNC, Bob; VK5KPR, Peter; and at 07:08, VK5PAS/P, Paul, at Kaiser Stuhl Conservation Park, and on 7.085, VK1DI/P1, Ian in Pinnacle Nature Reserve, VKFF-0862, 5 and 7 and 5 and 8. I thought I would try for some VK6s. I posted my intention to migrate to 14.312 which I found clear. I called CQ a few times to allow chasers to see my post on Parks and Peaks and was soon answered at 07:33 by VK4RF/VK4HA, Rick 5 and 9 each way: F1BBL, 5 and 5 and 5 and 3 received and finally, JA1QVR, Sam 5 and 8 both ways. I was using 40 watts and a linked dipole and Sam was transmitting with a kilowatt and a four element beam. He was chuffed and so was I.
I enjoyed myself making 36 contacts with one duplicate. Thanks to all of the chasers and, of course, the activators. I made five park to park contacts. Today was a Parks and radio day. In the morning my wife Jenny and I went for a walk in the Scott Creek Conservation Park. This was my first walk in the Park for some months due to health issues. It was great. The day was warm and sunny, the kangaroos were out and about watching us and the birds were singing. I was living for the day! Jenny was identifying a weed for the authorities: an Ivy plant that grows on the indigenous eucalypts, the brown stringy bark trees. She found at least three examples. We also saw a mob of dorper sheep. When they spotted us they ran towards SA water land which adjoins the conservation park. They owe their freedom to private gates nearby which were left undone during the motor car rally held in November. The Ranger will be advised. When we concluded our activities at Scott Creek Conservation Park we drove to Mylor Conservation Park which is also nearby in the Adelaide Hills. (I measured the distance in the car last evening when leaving Mylor Conservation Park and driving home the most direct way at 7.1 kilometres: thus I am in the fortunate position of having three parks within ten kilometres of my house). The purpose of the visit to Mylor was to check out possible operating locations. In the end I finished up going to the main gate off Whithead Road. This is not far from houses and a Buddhist Monastery and the noise was about S7. It was hard to tell how much of the background noise was simply that and how much was power-line noise. But at the end of the activation the noise had dropped to about S3. We also explored Hooper Road which runs along the Park boundary. We drove to the end of the road and the beginning of the fire trail. At this point the road branches into two private driveways. There is a Park gate about half way along this road but a glance over head showed bundled power lines. I did not even bother to try from that location! I decided I would return to the location of my first activation near the main gate off Whitehead Road. This photo shows my operating position with the FT897 on the left hand side of the table and 8.4 amp hour LiFePO4 battery. Even after 30 contacts the battery voltage was 12.9 volts. This photo shows a ten metre squid pole attached to my tripod. For this activation I did not guy the squid pole or use ten pegs to hold the tripod legs in place on the ground. There was only a light breeze. Mylor Conservation Park is a small park in the Adelaide Hills. It conserves remnant bushland in an area largely cleared for agriculture and residential development on small holdings (four hectares mostly) except in townships. There is a Friends Group and flora and fauna lists are available on the State Government parks web site. I began on 40 metres and after 17 contacts I decided to try 20 metres. I made five contacts on 20 including three DX qsos before moving back to 40 metres where a further ten contacts were made. Thanks to all who gave me a call, who posted my activation on Parks and Peaks as well as the DX cluster. I decided to end the activation because of the impact of my trespassing. While I gave my operating position a pretty good check for local inhabitants I decided to end the affair when I was bitten twice, simultaneously on the right hand pointer finger and left arm just above the wrist. The attackers were ants. I am not sure what species they were but they surely packed a punch. My arm is still swollen as I write this blog entry on Saturday morning. While ants have been attackers in the past on many occasions, these guys had the most impact on me. When I return to the park to try and secure 44 contacts I will set up in another location. The ants that can cause the most problems are hopper ants. THIS is the angry little ant that’s putting up to two South Australians a week into hospital emergency rooms, some with potentially fatal anaphylactic shock. The native hopper ant (Myrmecia pilosula), also known as the jack jumper, packs a painful sting from its tail — but for a significant proportion of people the consequences can be much greater. Last Sunday a 71-year-old Stirling man was taken to hospital by ambulance after being stung, a situation that has become common during summer, according to Professor Bob Heddle, SA Pathology’s chief pathologist and head of Clinical Immunology at the Royal Adelaide Hospital. Prof Heddle said the aggressive ant, which moves with a distinctive hopping motion, has been responsible — along with its cousin, the inch ant — for a least six deaths in Tasmania and Victoria in recent years, although he believes deaths caused by the insects are probably under-reported. So I cannot tell what bit me, except that the impact of bites from hopper ants are cumulative. So I will be careful in the future. VK5FRCP 58 59 Rex at Piccadilly. There had been no propagation locally through the afternoon until VK5FRCP called. Rex is located in the Adelaide Hills, a kilometre or two from Mylor Conservation Park. I decided to try 20 metres, but not before trying to contact VK5FANA, Adrian on the Yorke Peninsular. I called VK5PAS after he worked VK5FANA at 0552. I also listened for VK5FANA, operating just higher in frequency that me a few times while I was having a quiet moment between calls. I could not contact him. At 0700 I checked 14.310. It was clear and I spotted myself. I then listened for VK5FANA, who briefly popped up out of the noise and was not heard again by me. I could hear stations contacting Adrian and giving him great reports. Sorry Adrian, may be next time! I was pleased to have a contact with Paul, VK5PAS, who was activating Cromer Conservation Park, VKFF-779, on the 31st July 2015. It was a real Winter’s Day activation and only one month of Winter remaining. Roll on Spring! It was also World International Ranger Day. The shooting of Cecil the Lion in Zimbabwe is a reminder that in some countries the work of Rangers has added dangers.